Discerning craft beer drinkers can be a dismissive and an impolite bunch. The term “craft beer snob” can be a badge of honor when I turn down a Bug Light Lime; even a free one. Yet, it’s not a label I am comfortable with when I am drinking a craft beer that I find less than stellar. Brewers put lots of man hours and risk, financial and otherwise, into their craft. It’s hard for me to not always want to be supportive of the little brewery that could. Even when I find a beer not exactly perfect, I frequently just chalk it up to not being to my taste. De gustibus non est disputandum! Unless a beer is so bad its clearly a failure or I have to pour it out I will give the craft brewer the benefit of the doubt. Founder’s Kentucky Breakfast Stout (KBS) is a world class beer, worthy of all the superlatives that are regularly gushed upon it. It’s a beautiful beer wonderfully crafted and if you are a fan of bourbon and/or bourbon barrel aged beers it is high on the list of must haves each year. Year in and year out, KBS sets a high standard for what bourbon barrel aged (BBA) beer can be. After having a bottle the other night I can too say “Sunday Morning Stout is not as great as KBS.” You see Founder’s brew is just transcendent. It and its brother Canadian Breakfast Stout are highly regarded by beer snobs with good reason. But the twist here is I liked it precisely for the ways in which it was not like KBS. In my opinion, KBS is best after a few years of cellaring. Its astringency goes way down; the bourbon’s burn takes time to mellow out. Given sufficient time, the coffee notes quiet with vanilla and oak taking over. It’s just a better beer even after at least twelve months rest. In contrast, Sunday Morning Stout is ready now. This is a stark contrast. It’s a fully matured ready to drink BBA beer today. Sunday Morning pours thick like a quart of motor oil and sits in the glass heavily. Held up to the light shows off this opaque beer has a slightly reddish brown hue at the meniscus with a thick greasiness that clings to the glass. In the parlance of wine tasting, this beer “has legs.” Even from a slightly vigorous pour I only got a short tan head. The nose is not boozy but simply offers a whiff of the bourbon and oak with a backdrop of fresh roasted coffee grinds. As the beer clings to the glass, so it does for you after a pull. This one is greasy as hell with an enjoyable mouth feel; not as thick as KBS but more than sufficient to remain true to style. Coffee flavors play second fiddle to chocolate and roasted malts taking center stage. All the flavors you find are subtlety played here. Where the KBS plays tremolo the Sunday Morning is practicing portato. The bourbon barrel used with Sunday Morning brings out vanilla and caramel flavors; these are prominent in the finish while not evident at first. This is a beer that requires patience as as it opens with fresh air and dissipation of the refrigerated cold. As the beer comes up to temperature a warming astringency appears that is acceptable for this 11.3% ABV big beer. So yes, this beer is no Kentucky Breakfast Stout. In some ways its better as its more welcoming and fully ready for its time in the spot light right now. It gets the Bearcat Seal of Approval. Weyerbacher does big beers well. 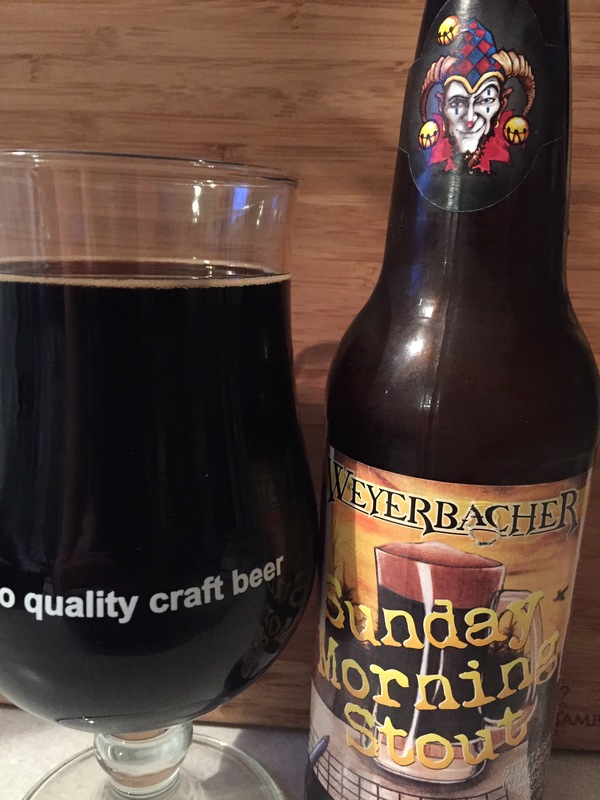 If you can’t get your hands on Sunday Morning Stout I also recommend picking up a variety case of Weyerbacher’s Big Beer. You will not be disappointed.